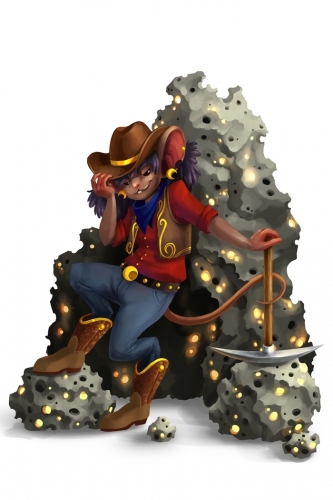 The Mining Materials Manager is a breed of mouse found in Fort Rox. They are known to drop Fool's Gold, Meteorite Pieces and Tower Mana as loot. This mouse catalogues, collects and manages all materials that move out of the meteor. Nothing gets past her watch! She determines pay rates by evaluating the haul brought back by the miners and sets them on their way. She is likely to have quite a few Meteorite Pieces on hand if you catch her! While Mining Materials Manager mice can be attracted by standard cheese, they have a distinct preference for SUPER|brie+. Law type traps such as S.L.A.C. are very effective against the Mining Materials Manager mice. Mining Materials Manager mice can only be encountered during the daytime phase in Fort Rox. The Mining Materials Manager Mouse drops the Day Egg during the annual Spring Egg Hunt. This page was last edited on 27 May 2017, at 01:51.